If you have been seriously injured, the last thing you need is your insurance company working against your interests. After all, you have paid your insurance company a lot of money and expect them to fulfill their duty to you: to defend you and reimburse you for your loss. Too often in serious injury cases, the victims hear that their coverage is denied or that the policy was not enough to cover the expenses. If you try to handle this yourself or with an inexperienced attorney, no settlement or a small settlement might be as far as your claim goes. 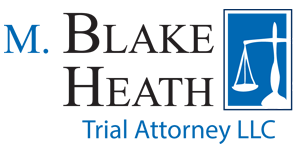 At M. Blake Heath, Trial Attorney LLC, we hold insurance companies to their two fundamental duties to fight for your rights and compensate you for your loss. Anything less and the injured party is a victim twice over. We understand that the last thing you want is to be involved in an insurance dispute after a severe injury, but it might mean the difference between having enough money to pay your bills and make up for lost wages, and not being able to be on the same financial footing you were on before the accident. Unfortunately, a denied insurance claim is becoming a more frequent occurrence whether the stated reasons are non-coverage or underinsurance. Too often, the insurance companies are acting in bad faith—either the coverage is in effect or an umbrella policy is in place. At M. Blake Heath, Trial Attorney LLC, we understand that insurance companies can and will breach their contracts if they think they can get you to settle for less than your case is worth. Fortunately, we are experienced litigators, willing to bring cases to trial, and have the resources to wage large-scale litigation if that is what it takes to hold insurance companies accountable. As insurance companies have become more and more reluctant to pay valid claims, our practice has grown to include many more areas of insurance company litigation.